All on-screen virtual keys work just as they would if you were typing on a standard computer keyboard. 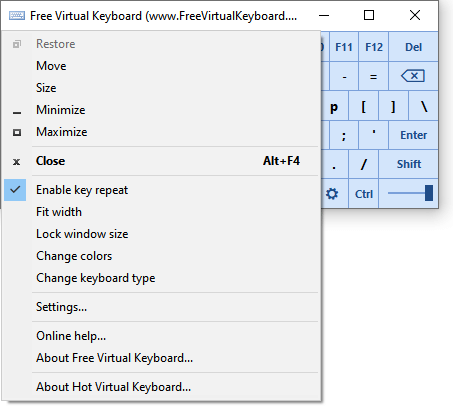 Select a key and Free Virtual Keyboard sends it to a word processor, e-mail message, web page or other Windows application you may be using. Keyboard can be moved anywhere on the screen and can be any size. Free Virtual Keyboard can be used anyone with a disability that prevents him or her from typing on a physical computer keyboard. Change size of the keyboard. 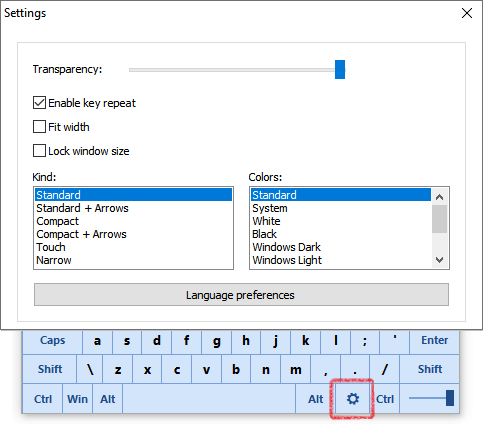 Change transparency of the keyboard. Turn on and off a key-repeat function ("Enable key repeat" setting). Scale the virtual keyboard to match the screen width ("Fit width" setting). It's a useful feature for frequent screen rotation in the portrait and landscape modes. Change kind of the keyboard. Available 4 kinds of the virtual keyboards. Type text in any language. Type text in other layouts (e.g. United States Dvorak for Left Hand). In the Windows Start menu, click Start, and then click Control Panel. Click Add under "Installed Services", and then click the language you want to add and the keyboard layout you want to use for that language. Free Virtual Keyboard is a free program for personal and commercial use. This program is distributed on AS IS basis, and WITHOUT ANY WARRANTY; without even the implied warranty of MERCHANTABILITY or FITNESS FOR A PARTICULAR PURPOSE. Comfort Software Group cannot be made responsible for any, direct or indirect, damage caused by the program. Comfort Software Group reserves the right to change licensing terms in future. Hot Virtual Keyboard packs a number of advanced features to make on-screen typing faster, easier and more accurate. Fully customizable look and behavior.